← Is Walking to School Part of Americana History? As a follow-up to last week’s post where I lamented that few children walk to school in my neighborhood, I asked an urban planner friend to give me her take on the situation. Mallory Baches joins us today at OnBalance. As an urban designer, I have a responsibility to people’s relationships with my work, so I took note when another study attached community form to public health. Published in the upcoming issue of the American Journal of Preventative Medicine, you might mistake the scientific findings for common sense: children who live in more walkable communities tend to walk more. Go figure! 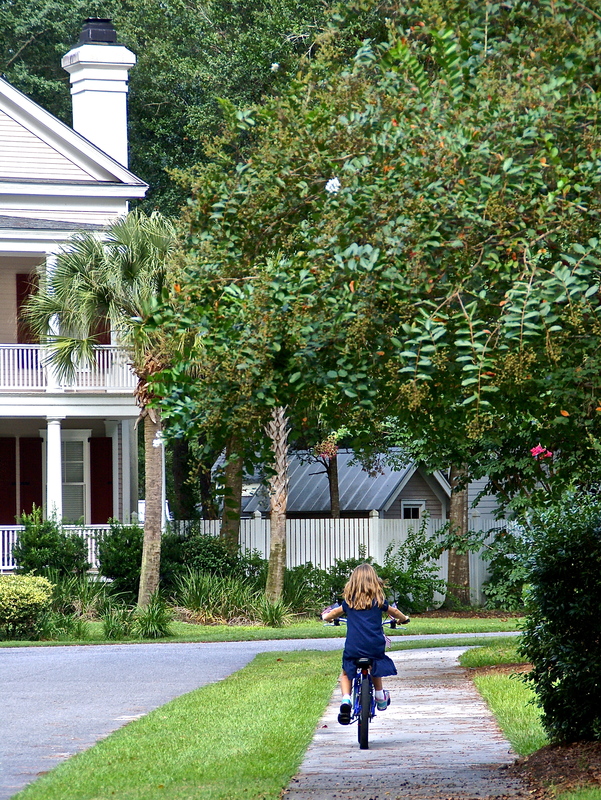 The study, Smart Growth Community Design and Physical Activity in Children, measured the physical activity levels of children in a California neighborhood designed according to principles known as “Smart Growth” within the planning industry, comparing them to children living in more conventional cul-de-sac subdivisions. Promoting a mix of land uses and open spaces, a diversity of housing types within a compact neighborhood, and an interconnected street network that allows for a variety of transportation choices, smart growth communities not only tend to look different from their counterparts but also tend to live differently, too. And so the study found: children living in the smart growth community had a 46% increase in daily neighborhood moderate-to-vigorous levels of physical activity (MVPA). Put simply, the kids in the smart growth community tended to use their neighborhood as a playscape much more. And while the potential added impact of community design identified by the study might seem slight at only 10 daily minutes, those minutes do add up. With a daily recommendation of 60 MVPA that many school-aged children simply don’t get, the increase that community design might prompt is a welcome contribution. I live in a smart growth community myself, in addition to designing dozens throughout my career. I am also a parent who chose to raise my daughter here in Habersham in no small part because of the benefits that our neighborhood’s design provide to her. There are dozens of parks and open spaces, some with intentional play structures or swings and others with open space or nature trails for exploration. Most streets have sidewalks and everyone knows each other by name, promising both a watchful eye and reassuring help for whichever my daughter and her friends might need when they have wandered to the far reaches of our neighborhood. The walkability of our community allows me to encourage that wandering. It means that, while my husband and I are busy making dinner, she can play a quick pick-up game of soccer with the neighborhood kids in the park a block away. It means that, on the weekends when she has inevitably become bored by the entertainment offered at home, she can ride her bike and rally some friends so that they can race each other down the biggest hill in our neighborhood. And in that wandering, she’s getting the physical activity I know her growing body benefits from, without structure or planning or carpools or chaperoning. Most days, we manage to wander as a family too. We are all able to enjoy a healthy level of physical activity as a natural part of our daily lives, and what could be more common sense than that? Mallory B.E. Baches is an urban designer and civic specialist certified by the AICP, LEED, and CNU. She is the founder and director of The Civic Hub, a civicism incubation firm that blends her design and implementation skills with her passion for small towns and the community-supportive systems that help those small towns thrive. This entry was posted in fitness, healthy living and tagged children, community, family fitness, positive action, wellness. Bookmark the permalink.